A GROUP OF nurses at the Mater Hospital in Dublin are raising money for non-medical items for in-patients to make the ward feel more “like home”. 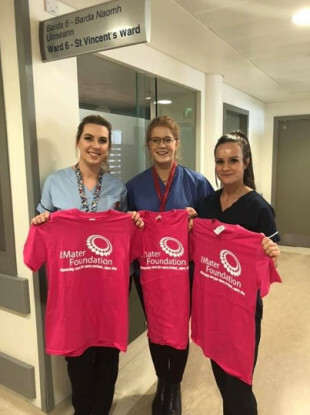 Six nurses who work on the St Vincent’s Ward, an in-patient oncology and hematology medical ward, are planning to run the VHI Women’s Mini Marathon on 2 June to raise money for items such as exercise bikes and other forms of holistic care. “Unfortunately, we all know a family member who has been affected by a cancer diagnosis,” the nurses wrote on their fundraising page. “As six nurses working on St Vincent’s Ward … we see what patients and families go through first hand, and our aim is to try to improve their experience with us as much as we can from diagnosis to discharge,” they wrote. Many patients stay on the ward from between six months to a year receiving chemotherapy and other treatments, according to the nurses. On 13 March, they carried out a survey on the ward to ask patients and families what they thought would make their stay at St Vincent’s Ward easier and how they could feel more “at home”. The nurses said patients felt they would benefit from fitness equipment such as exercise bikes and other forms and holistic care. And with that, the nurses are now aiming to raise money to buy six or seven exercise bikes for the 24-bed ward. They’re also looking at getting an entertainment station for the ward. “We’d like an Xbox, Playstation, all that kind of stuff that can be loaned out to different rooms, maybe an iPad,” one of the nurses, Joanna Lambe, said. When asked whether she thinks these sort of items should be funded for the ward through the HSE, Lambe said: “If the HSE was providing for all that kind of stuff then there’d be less funds to provide for the actual treatments that the patients need. This is totally independent of the hospital, we’re doing this off our own back. It’s just something that we want to do for our patients. Lambe said that having exercise facilities on the ward will be beneficial to the mental health of the patients. “A lot of patients wouldn’t have the resources … to go out and buy things like that for a sudden hospital stay, if it’s unplanned for,” Lambe said. “Especially the exercise bikes. There is physio and there is all that kind of stuff but just for them to be able to do a bit in their own time, it’s going to be amazing for them,” she said. Exercise helps everyone’s mental health and if they’re inside four walls for five or six months and not being able to get out, it’s going to be great for them. Fundraising pages have been set up on Facebook and GoFundMe. Email “These Mater Hospital nurses are raising money to help make patient stays feel more 'like home'”. Feedback on “These Mater Hospital nurses are raising money to help make patient stays feel more 'like home'”.